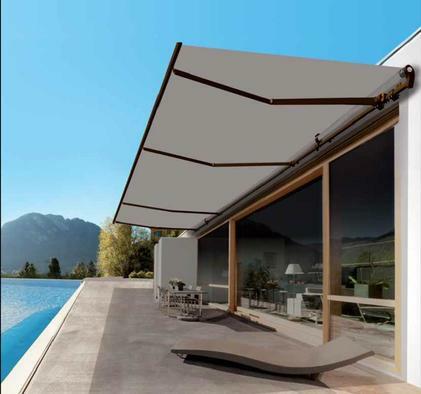 The Arundel is a new addition to the Sunkut Systems® range of foldaway awnings. The Arundel is a square bar awning system without a cassette. The Arundel can go to a width of 15m (49'3") with spring loaded arms with stainless steel chain manufactured to TÜV standards with projections of 1.5m (5'0") to 3.5m (11'6"). The Arundel can be operated via a Somfy electric motor with remote control and can be fitted with sun and wind sensors or operated via gear box and detachable handle. The Arundel comes as a standard white powder coated RAL 9010. Other RAL colours are available on request. With a large range of colourways and fabrics to choose from including Acrylic and Weavetop with matching valances available in many attractive shapes. The Arundel can also be linked to your Somfy TaHoma smart home system and operated via your smartphone or tablet. image property of LLAZA WORLD, S.A.